The majority of funding for this program is provided through a contract with the CDFA which is made possible through an assessment paid by the wine grape growers themselves. This is another example of a program funded by a specific industry because it is beneficial to them. There were only four shipments of nursery stock rejected in the entire state in 2011 due to the presence of the Glassy Winged Sharpshooter (GWSS). The statewide board that guides policy and directs funding for the this program reported that pest detections on more than 44,000 nursery stock shipments were the lowest number since the start of the inspection program nearly a decade ago. The GWSS is an insect that feeds on plant juices and is extremely fond of grapevines. While feeding, the insect spreads a disease that can severely damage the vines that produce wine grapes, reducing yields and in some severe cases require major replants. 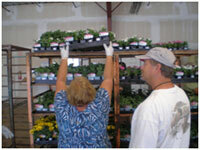 Nurseries that wish to ship plants to certain areas of the state, must have 100% of the plants inspected prior to shipment. The GWSS crew may inspect over 75,000 individual plants a month during peak periods. Most of the work is done by seasonal inspectors. The crew also includes a small number of permanent Insect Detection Specialists, and a Supervising Agricultural Inspector. 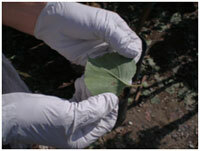 The Pierce’s Disease/Glassy Winged Sharpshooter board reports that throughout the decade that the program has been in place a collaboration of state, federal and local agricultural departments, winegrape growers and research institutions has made significant strides toward controlling the pest. Research also is helping to build a foundation of new information and scientific advances to close in on permanent solutions to Pierce’s Disease.